Jeff Parker populates Aquaman Vol. 5: Sea of Storms with a bunch of giant monsters, if that's your idea of fun. Unfortunately, after four volumes of Geoff Johns's strong world- and character-building, Parker's first Aquaman outing pales in comparison. Whereas Johns delivered dynamic, mythos-building stories with Aquaman villains Black Manta, Ocean Master, and the Scavenger, there's little here of note from Parker, just a series of action sequences involving threats unlikely to ever be seen again. There are some cute ideas here a couple chapters in, but they get lost in the book's somewhat haphazard structure. In the third chapter of Sea of Storms, Parker has Aquaman Arthur Curry and Mera attend Arthur's high school reunion. The sequence is too predictable by half, with the requisite bullies and jealousy and eventual reconciliations; it also comes in an odd break from the main action and is never referenced in this book again. However, Parker hits on something that Johns set up but never explored, that Arthur was at one point a normal teenager in this town of Amnesty Bay, and so had school friends and a normal life before Atlantis ever came into the picture. This high school reunion-type story wouldn't work with an identity-revealed Superman because Superman's just too much a godlike figure, but Aquaman's punchline notoriety (tinged with a hint of danger since the Atlantis war) situates him perfectly to be cajoled and jeered by the high school crowd. Artist Paul Pelletier goes too over-the-top with Mera's dress (and buxomness) in the party sequence, but there's something utterly endearing about Arthur and Mera drinking beers around a campfire with his school friends in the end, that again wouldn't work with Superman, Batman, Wonder Woman, or so on. Again, however, these school friends play no part afterward, such to make it unclear what Parker's going for. Of the six regular issues collected here, plus an annual and an issue of Swamp Thing, two have Aquaman fighting a giant sea monster called a Karaqan, two have Aquaman fighting ancient demons, and one has Aquaman fighting the mythological Hercules. Charitably, the Hercules battle takes place near an inch of water, but really there's little to distinguish this as an Aquaman story at all (compare to the very personal nature of the Black Manta, Ocean Master, and Scavenger threats). The villains aren't terribly interesting first because they have no stake for the reader to follow -- they're either monsters, crazed, or thoroughly evil -- and second because they have little or nothing to do with Aquaman himself. Hercules's appearance does give Parker an excuse to team Aquaman and Wonder Woman in the Aquaman annual. But Parker barely scratches the surface of the two characters (one born in royalty and trying to fit in to Man's World; the other raised as human and now trying to adjust to royalty) with most of the chapter given over to action sequences. The art by Yvel Guichet is often too distorted; also in a sequence where Aquaman and Wonder Woman are meant to be undercover, Diana's outfit seems dated and she wears her Wonder Woman boots, while Arthur for no good reason has on a variation of his green gloves. What redeems the annual is a second story by Parker and Alvaro Martinez teaming Wonder Woman and Mera, whom Parker writes more confidently than Aquaman. In fact, not only does Aquaman get offended at a clearly innocent comment from Wonder Woman, and not only does Parker demonstrate him as a particularly bad Atlantean politician, but also Parker has Aquaman continue to attack Swamp Thing even after Swamp Thing says, more clearly than I've ever seen one character say to another in a comic book, that he's not a threat and they ought not fight. The latter sequence especially made me wonder how Parker intends for the reader to understand Aquaman, since Swamp Thing is so clearly right and Aquaman is so egregiously wrong and overwrought; surely the fight-and-team-up trope has long precedent, but there's a way to do it that we root for both sides. That's all after a sequence where Aquaman's trident is stolen from his house simply by the thief spying through Arthur's window as he enters his alarm code (Justice League-grade security, anyone?). In none of this do I come away thinking of Aquaman as a competent hero, which is again a long way from the tortured leader of the Johns run. There's interesting bits also, away from the Aquaman story, where Mera survives an assassination attempt and is assisted in finding the assassins by Tula, known as Aquagirl in other continuities. Jeff Parker images an intriguing set-up for Atlantis in which more provincial communities are found farther from the surface than others, with ties to how much light and pressure they receive (not unlike actual sea life). That's all got promise, and I hope Parker investigates that further in the next volume, and ties in Aquaman Vol. 5: Sea of Storms's nascent surface supporting cast, too. As it stands, this volume was a step backward, just after one of the best volumes of Geoff Johns's run (Aquaman Vol. 4: Death of a King); I very much hope Parker can turn it around from here. I read Parker's run while it was being released monthly and enjoyed it a lot. Geoff John's run was amazing and like you point out he did some great mythos-building stories. My problem with it was that the title was always building towards a new, giant epic storyline with little room to breathe. 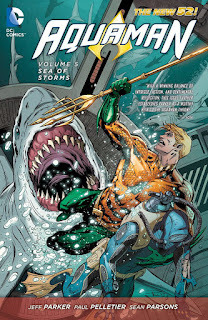 With Parker's run, I loved that he started out doing smaller stories that were either done in one or two issues while weaving longer running stories in the background like the man investigating Arthur, Coombs getting attacked by the sharks and being experimented on, and Mera huting down the assassins. In an era where everyone writes for the trade and makes five or six issue long arcs (that sometimes doesn't need to be that long) having someone do the opposite made me happy. Then, when Parker did a longer arc with Maelstrom it felt like something special (and he still managed to find a way to make some of the issues feel more stand-alone). I think Parker also did a good job of building on what Johns had done and expanding on it. He easily could have ignored a lot of the stuff Johns had introduced but instead he took it in new directions and used several of the Atlantean characters Johns had focused on. I am definitely a fan of giant monsters so I loved the two issues featuring the Karaqan. I also liked the Giant-born and Hercules. Sure, they're not the usual Aquaman villains and like you said they probably won't be seen again but I don't see what's wrong with that. I'd rather see new threats introduced than just the same villains used over and over again. I loved all of Parker's run and was sad when he left the title. I think if he had stayed on longer his run could have been just as grand as Geoff Johns' run. Great comment. I'll give you that Parker didn't write for the trade and indeed that's worth a nod. I'd still have preferred something more Aquaman-specific -- Hercules for me is still a head-scratcher -- but I see what you're saying.